PSM Forum Welcomes you • View topic - How to read Thai Postmark date ? How to read Thai Postmark date ? If you receive the above postcard from Thai collector , How to read Thai postmark date ? At Thailand we used Buddhist calendar so why you find all Thai postmark date is B.E , then the above Postcard send out from Mobile Post Office on date 14.01.2009 .The year is counted from the Buddhist Era (B.E. ), which is 543 years earlier than the Christian Era (A.D.). For example, A.D. 2008 is equivalent to 2551 B.E. The era is based on the passing away (Parinibbana) of Gautama Buddha, which is dated to 543 BC by the Thai (although some sources state that Buddha died in 483 BC). But you also find A.D. postmark date from Thailand but have a bit such as Suvannaphumi International Airport Mail Center used A.D. postmark date, because this mail center must exhcange mail bags with overseas both inbound and outbound or at Wan The Wawet Postoffice. At my know in Thailand not over 10 post offices used A.D. Postmark date. Re: How to read Thai Postmark date ? This is an eye opener. Just checked my Thai postcards, unfortunately most postmarks are not clear. 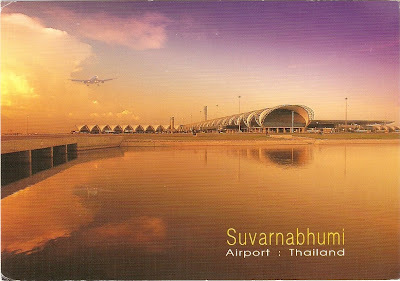 Below is the postcard of the new airport and I sent the postcard to myself from there in Sept 2008. It uses the Buddhist year "51" instead of "08"
smspenang wrote: This is an eye opener. Just checked my Thai postcards, unfortunately most postmarks are not clear.